Also known as the Spring Draw Segment, the Antelope Creek Crossing is a heavily rutted segment of the Bozeman Trail that runs down a hillslope to Antelope Creek, later an important stage stop. A party of emigrant travelers accompanying 1866 diarist Ellen Fletcher camped along a stream course bisecting this segment of the trail. Stage coach operations required the Rock Creek Stage Line to locate a station on Antelope Creek in 1877. The stage station offered good watering and forage and featured a blacksmith shop. The Braehead Ranch is significant for its association with the settlement of the Upper La Prele Valley in Converse County and as a very successful ranch where cattle were raised. Braehead is also significant for its association with the ranch's founder, George Harry Cross, who was a distinguished rancher and businessman as well as government official who served in the Wyoming State Senate and as a Converse County Commissioner. 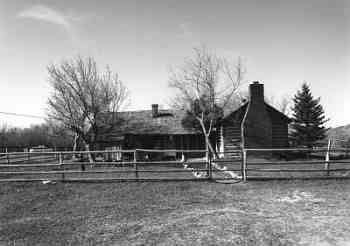 George Harry Cross initially established a very modest log homestead in an area of Wyoming that was undeveloped, and quickly succeeded in expanding his ranching operations. 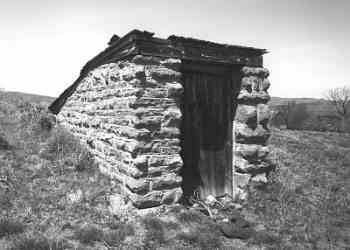 The ranch became a social center and the Beaver Post Office was located there for fifteen years. Braehead Ranch is named for the home of Cross's ancestors from Scotland although Cross himself was from Canada. He moved to Wyoming Territory in 1875. He purchased property in the La Prele Valley during the early 1880s and had a small log cabin constructed for him by Peter George. 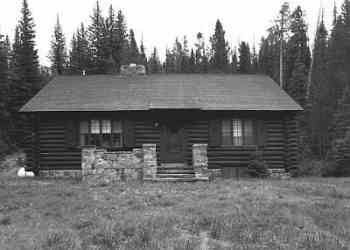 He brought his bride, Lea Marie, to Wyoming in 1884 to live in the modest cabin. The ranch has retained a great deal of its original appearance and there are 18 significant historic features. Few modern structures have been added to the ranch and a substantial number of the original nineteenth and early twentieth century Cross buildings survive. Designed by G.W.G. Van Winkle and constructed in 1898, the Christ Episcopal Church of Douglas is a modest example of the Gothic Revival Style which became popular in the middle and latter part of the 19th century. 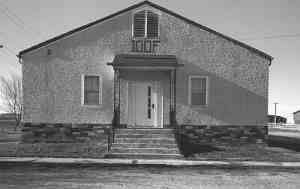 The church was the focal point of cultural and social evolution in the small frontier community of Douglas. Voluntary associations sponsored by church groups awakened settlers to a recognition of shared social and moral interests and fostered social cohesion during early settlement. The Christ Episcopal Church was utilized by all denominations before the construction of their own churches. Activities sponsored by the church organizations included carnivals, balls and concerts, ice cream socials, bazaars, picnics, plays, holiday celebrations, and weekly dance suppers for the entire community. Today the Church continues to function as a community meeting place and church groups are still active in sponsoring community activities begun in the first years of settlement. The College Inn, established in 1906 by Theodore (Lee) Pringle, is unique in the fact that it is the oldest business in Douglas and Converse County continuing in one location. 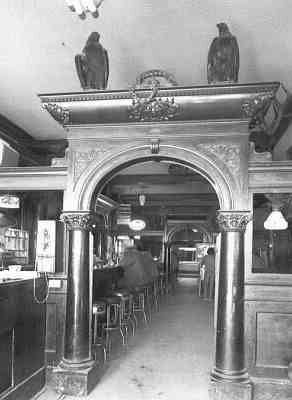 The bar's predecessor, a saloon begun in 1887 by this same gentleman - and thus known to early Douglasites simply as ''Lee Pringle's'' - was a frame structure which served for 19 years as Mr. Pringle's prime business establishment prior to being moved from North 2nd Street to make way for the new College Inn. 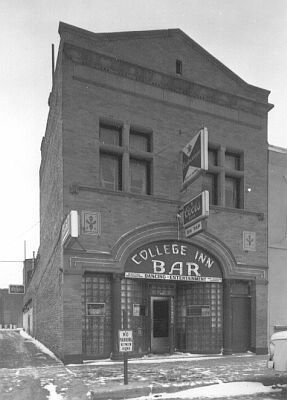 On the College Inn's second floor were, at one time, nine lavishly furnished sleeping rooms - remembered by old-timers around Douglas as the ''best in town.'' A tenth upstairs room was designed for gambling, and had bar service by way of a dumbwaiter. These rooms are no longer used, although during the latter 1930s and early 1940s the Inn's owners of those years maintained a spacious upstairs apartment. The bar business in Douglas and elsewhere, affected first by Prohibition, then by the rationing of alcoholic beverages during World War II, has had its good years and its bad. But the College Inn has perhaps succeeded better than most businesses in Douglas by hanging on through thick and thin, achieving for itself the distinction of being Douglas' oldest business to have operated continuously in the same location. 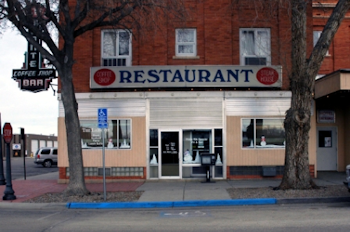 The Commerce Block is located at the southeast corner of Birch Street and Fourth Street in downtown Glenrock, Wyoming. It is a two-story, dark red brick commercial building with a flat roof, built in an L-shaped configuration. Its most distinctive feature is its regularly spaced rows of brick pilasters capped with cream-colored terra cotta that divide the west and north finished sides of the building. The building occupies a corner lot and finished facades face both Birch Street and Fourth Street. The east and south sides of the building are unadorned plain tan-colored brick walls or brick covered with stucco. The building was constructed by Edward A. Reavill, who was an established building contractor in nearby Douglas. The Commerce Block was a key element of the commercial district of Glenrock, and it represents the economic growth of that community in the early 20 th century. The building was constructed in 1917 during the oil boom of the late 1910s and early 1920s, which was brought about by the discovery and development of the nearby Big Muddy Oil Field and the subsequent construction of two major refineries west of town. The oil industry created jobs for hundreds of employees and related service industries and provided a steady payroll, much of which was injected into the Glenrock economy. 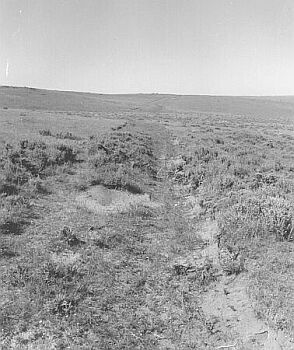 The Dorr Ranch represents the inherent difficulties faced by homesteaders who attempted to ranch in the arid areas of eastern Wyoming. William and Mabel Dorr established the Dorr Ranch in 1915. 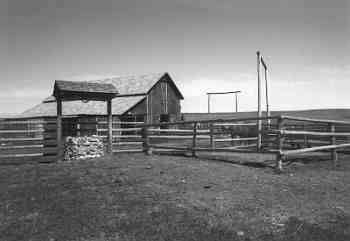 The Dorrs primarily raised horses and cattle during their tenure at the ranch. 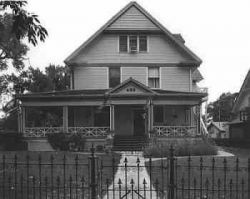 During their ownership of the property the Dorrs experienced a series of financial hardships until they sold the property in 1928. The main house continued to be occupied until 1949. Buildings and structures remaining on the site include the main house, two log cabins, stable, windmill, cistern, and the remains of a schoolhouse. 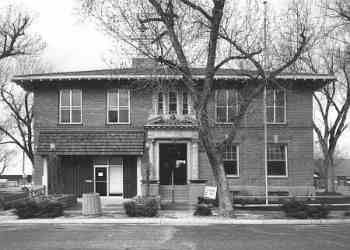 The Douglas City Hall is significant for the vital role it played in the development of the city of Douglas, serving its civic needs in the form of fire station and jail, as well as City Hall. 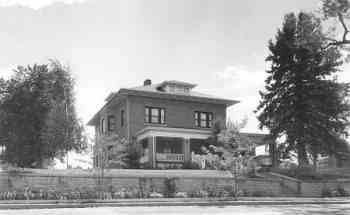 It was designed by the well known Denver architect William Norman Bowman in 1915 and construction was completed in August of 1916. The building indicates the community's structure, organization, spirit and community pride. It represents the growing optimism on the ''lingering frontier'' at the transition from the 19th century frontier to the 20th century. The City Hall, and its companion building, the County Courthouse (demolished in 1978), were symbols of the hopes and aspirations the inhabitants had for Douglas as it turned from a collection of tents and rude shacks along the banks of the Platte River into a modern city at the dawn of the 20th century. 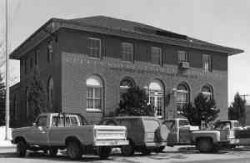 The Douglas City Hall continued to serve the City of Douglas until 1989 at which time the city government moved into another building. This thematic study includes twelve post offices owned and administered by the U.S. Postal Service (USPS) throughout the State of Wyoming. 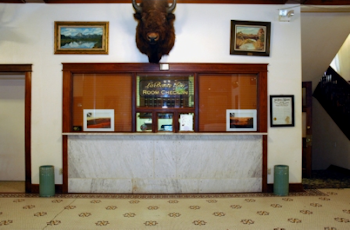 These include the Basin, Greybull, Douglas, Lander, Torrington, Thermopolis, Buffalo, Kemmerer, Powell, Yellowstone, Evanston, and Newcastle Main Post Offices. The buildings represent a continuum of federally constructed post offices allocated to the state between the turn of the century and 1941. The buildings exhibit a variety of styles and sizes but maintain a common demeanor representative of the federal presence. All of the buildings were constructed from standardized plans developed from guidelines provided by the Office of the Supervising Architect in the Treasury Department. Variations in design styles reflect both the transition in the design philosophies of the Supervising Architect and the requirements developed in response to the Depression. These variations in design, as well as functions are also somewhat related to the communities in which they were placed and reflect the economic, political, and governmental context of those communities. 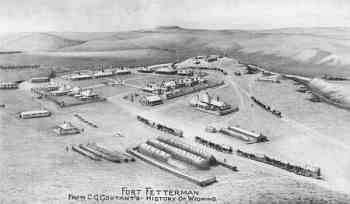 Fort Fetterman was established as a military post in July of 1867. It was located on the North Platte River at the crossroads of the Bozeman Trail and the earlier overland trails. After the abandonment of Forts Reno, Phil Kearny, and C. F. Smith in 1868, Fort Fetterman became the primary protective establishment in the heart of hostile Indian country. 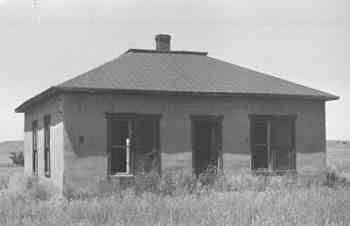 Its strategic location made it a supply base, a headquarters and a marshaling point for several major military expeditions during the final ''Indian Wars'' on the Northern Plains. The post was named in honor of Bvt. Lt. Colonel William J. Fetterman, an infantry captain who, with his whole command of eighty-one, was killed in a fight with Indians near Fort Phil Kearny, December 21, 1866. Major William McEnery Dye with companies A., C., H., and I. of the Fourth Infantry began construction in July, 1867, and Brigadier General H. W. Wessells became first commanding officer in November of the same year. Quartered in temporary dwellings the first winter proved difficult for the garrison. The following year these dwellings were replaced by more substantial structures of adobe, wood and stone. The development of the post continued until 1870 when it became well-established and destined to play a conspicuous part in United States military and Indian affairs for the next few years. In 1876 it became the base for three of General George Crook's Powder River Expeditions. One expedition culminated in the ''Battle of the Rose Bud'' in which Crook came to a stand-off with his Sioux and Cheyenne opponents. These and other military actions brought the inevitable end to hostile Indian conflicts on the Plains. The role of Fort Fetterman in breaking the back of the Indian resistance also spelled the Fort's eventual doom. With the hostiles confined to reservations the post had outlived its usefulness. Military abandonment came in 1882. 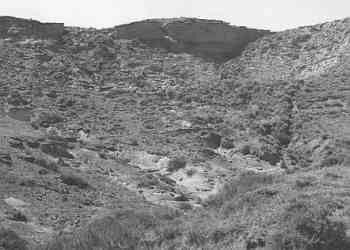 The Fort fell into a state of decay in the 1880s and most of the buildings were sold, dismantled or moved to other locations and the site was quietly taken over by local ranching interests. 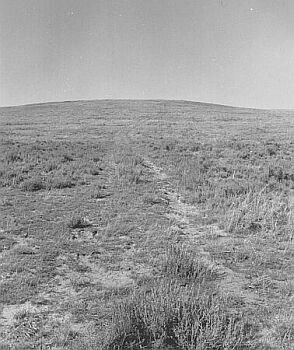 The site of Fort Fetterman was purchased by the State of Wyoming in 1962 and is open to the public as Fort Fetterman Historic Site. The Fremont, Elkhorn & Missouri Valley Railroad (FE&MV) Passenger Depot is a one-story wood structure constructed in 1886. The depot stands in the rail yards which bound the western end of the principal business section of Douglas. The design of the passenger depot was a standardized plan developed by the Chicago & Northwestern Railroad (C&NW), of which the FE&MV was a part. In the summer of 1886, Douglas owed its existence to the coming of the railroad, and the city's continued life and economic stability depended on this transportation network. When the end-of-the-line moved west to Casper in 1888, the little community nearly folded, but it continued to grow steadily as the area's resources found markets in the East, first cattle, then sheep, then coal, then oil, then electric power, each made marketable by the railroad and its ability to bring in and take out the materials and services necessary for economic success. Even Douglas's major yearly event, the Wyoming State Fair, owes its origins to the C&NW, which donated the land for the fairgrounds in 1905. As the little-changed, physical representation of the most powerful force in the history of Converse County during the period 1886-1960, the FE&MV/C&NW Depot is a significant representation of the locality's history. The Glenrock Buffalo Jump encompasses three features: a large flat plateau which extends to the edge of a 40 foot bluff that served as the ''jump-off'' point. Below the bluff is several dry washes extending down a steep talus slope. Large quantities of buffalo bones and other cultural remains are deposited in the soil of the talus slope. The Late Prehistoric site dates to approximately A.D. 400 to A.D. 1750. Archaeological investigations have revealed up to four feet of deposits indicating several periods of use. Buffalo jumps were an important part of the Northwestern Plains prehistory. They represented a stylized pattern of food procurement for a long period of time. The Holdup Hollow segment of the Bozeman Trail exhibits the widely variable nature of trail corridor width. Many discernible rut pathways are seen. This segment lies within Holdup Hollow, a reputedly favored spot for stage robbery during the early days of the local stagecoach lines. The Hotel Higgins was built during Glenrock's oil boom of 1916-1917, when central Wyoming experienced unprecedented growth. Built on the site of the Deer Creek trading post and stage station, Glenrock was at the center of the oil development activity. In late 1916 the firm of Humphrey and Whiteside made a major oil discovery in the Big Muddy field west of Glenrock; other discoveries followed, in the Deer Creek and Dry Creek fields. In response to the oil boom and the influx of new citizens, John E. Higgins built the Hotel Higgins. A contemporary newspaper account called the new Hotel Higgins ''one of the most elaborate and finely furnished hostelries in the entire Rocky Mountain region.'' The architect and builder was Edward Reavill, who constructed a 2 1/2 story, 38 room hotel. Each of the hotel's rooms was trimmed with mahogany, and was ornately furnished. The hotel has been in continuous operation under different owners since it was opened, and has witnessed the growth of this area. 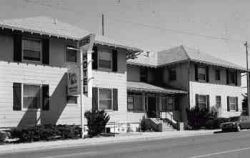 As the scene of social affairs and civic meetings, even providing office space for the Glenrock city government, the hotel has been instrumental in the maturing of the town itself. The Higgins is the only early twentieth-century hotel that remains operating in Glenrock, a reminder of its ''boom town'' period. The Hotel LaBonte is eligible for listing in the National Register of Historic Places under Criterion A. The hotel, erected in 1913 and opened in January 1914, was a community project and part of the expansion and remaking of downtown Douglas during the 1910s. 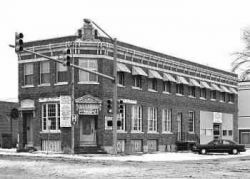 Local businessmen formed the Douglas Hotel Company to finance the construction of a building that the company would retain ownership of and lease. The Hotel LaBonte is the physical expression of the prosperity and the aspirations of the residents of Douglas for a modern hotel, as well as the Douglas building boom of the period. The Hotel LaBonte, which remains in use, initially housed train passengers, local ranchers, Wyoming residents in town for the County Court session, and motorists on the Yellowstone Highway. The Hotel LaBonte is a three-story brick building located at the northeast corner of North Second and Walnut streets in downtown Douglas. The hotel, which has a U-shaped form with east and west wings flanking a recessed central wing and enclosing a courtyard, has the symmetry and formality of the neo-Renaissance style and is enriched with terra cotta elements. The ground floor level has two storefronts in the west wing and the hotel dining room in the east wing. 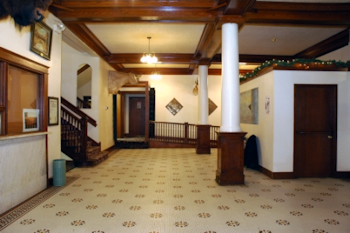 Columns, a beamed ceiling, and ornate tile floor carry the architectural stylishness of the exterior into the hotel lobby, which retains its historic character. A renovation of the Hotel LaBonte building that began in 1967 and another one as part of the reconstruction after a fire in 1981 introduced replacement windows, the dance hall addition, new signage, an exterior entrance in the south end of the east wing, and internal changes. The Hotel LaBonte has excellent integrity with regards to design and workmanship. Though changes have been made to the ground story and replacement windows have been installed, the building also has good overall integrity in terms of materials. The hotel lobby has very good integrity in design, materials, and workmanship. The hotel building has excellent integrity in location, setting, feeling and association as it continues to serve its original functions as a hotel with hospitality services on the ground floor. Douglas, an east central Wyoming city on the North Platte River, is located in close proximity to various transportation routes. Douglas is near the Oregon Trail and the southern end of the Bozeman Trail. 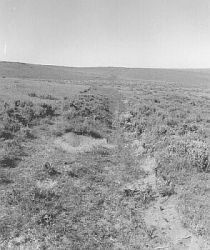 The construction of a railroad line that paralleled the route of the Oregon Trail brought about Douglas. Douglas experienced an immediate boom in population that reached 1,600 by the end of 1886. The first buildings erected in Douglas included five brick ones. 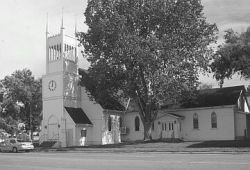 A group of citizens worked to organize a municipal government, and in September 1887 the town of Douglas was incorporated. Douglas was selected as the county seat in 1887 when Converse County was separated from Albany and Laramie Counties. 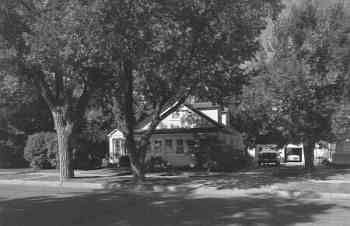 The federal land office established in Douglas in 1890 upon Wyoming achieving statehood made it easier to homestead and purchase land in the county. The railroad provided a means to ship livestock, and a cattle and sheep industry grew up in the area surrounding Douglas. Stagecoaches carried mail and passengers from the railroad line in Douglas to the regional towns of Buffalo, Sheridan, Rock Creek, and Laramie. Cattlemen and then sheepmen settling in and near the town, along with businesses related to agriculture, rescued Douglas from a major drop in population during the late 1880s and made it a thriving small town. A small commercial district grew up near the railroad line on North Second Street, the eventual home of the Hotel LaBonte. Douglas grew rapidly for the second time between 1900, when it had 734 residents, and 1910, when the population was 1,512. Douglas acquired an additional railroad connection; the Chicago, Burlington, and Quincy (Burlington) Railroad reached Douglas in 1914. During the 1920s, the C&NW and Burlington lines ran six passenger trains daily supplemented by locals with passenger cars. Douglas had daily passenger train service from 1888 to the mid-1960s. This additional railroad link and a location on the Yellowstone Highway contributed to the prosperity of Douglas through the 1910s and early 1920s. The Good Roads Club of Douglas, which was founded in 1910 and evolved into the Chamber of Commerce, lobbied for and promoted the Yellowstone Highway, a route that connected Denver with Yellowstone Park, and Douglas became a stopping place for motorists between the national park and Denver. The Yellowstone Highway, discussed as early as 1912 and celebrated with an official guidebook in 1916, was absorbed by the “Park to Park Highway,” which eventually connected all the major national parks in the west. During the mid-1920s, the Yellowstone Highway east of the national park became US 20. Thousands of tourists drove the gravel highway during the summer months. 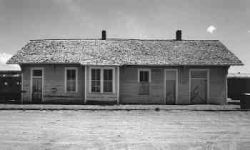 Hotels and rooming houses were an important component of the commercial economy of Douglas, which was a transportation, local government, ranching, and shipping center. Ranchers visiting town for a few days needed accommodations and court sessions at the Converse County Courthouse were busy times in Douglas. The property known both as the Valley House and later as the Davis Hotel, located on the south side of Center Street next to the rail line, was opened for business in December 1886. By 1913, Douglas needed an additional hotel and seven men met in early January in the office of E. T. (Edward T.) David to consider the challenge and ended up pledging $12,500 worth of stock at that initial meeting. The Douglas Hotel Company was incorporated in February 1913 to ensure that the community would have a first class hotel. The company raised $25,000 through the sale of shares in order to build the hotel, which it would lease to an operator. The company planned to erect a three-story hotel with at least 50 rooms costing at least $50,000. Within the month, all $25,000 worth of bonds were subscribed. 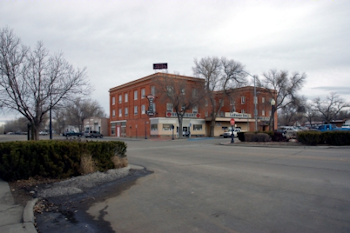 The Douglas Hotel Company engaged the architectural firm of the Baerresen Brothers, which had offices in Cheyenne and Denver, to provide plans for the hotel. Edward Reavill’s construction firm was at work on the new building by April 1913. Twenty-five tons of steel beams formed the trusses that supported the second floor above the open spaces of the lobby, dining room, and other public spaces. The local Douglas pressed brick plant supplied the brick for the hotel. By the time the hotel was opened for business on January 26, 1914, it was the Hotel LaBonte. The name refers to the LaBonte pony express and stage station on the Overland Trail, which was located southeast of Douglas and named after a hunter of a French father and mother from Kentucky who was raised in Mississippi. The rooms in the Hotel LaBonte had all the modern technology and safety features of the era, as well as luxurious furnishings. Electric lights, steam heat, and hot and cold running water were available throughout the hotel and telephones were placed in each of the 54 guest rooms. Twelve of the larger rooms had full bathrooms; the rest had sinks. The rooms were furnished with brass bedsteads, heavy rugs, and leather-covered mahogany and oak furniture. A pair of fire escapes was attached to the north side of the building at the north ends of the side corridors. The Douglas Hotel Company’s ownership of the hotel made it as much a community project as a private business. The newspaper editor wrote of the new hotel as an important community asset and a testament to its supporters’ faith in the future of Douglas. The size, materials, and architectural expression of the Hotel LaBonte are consistent with the construction that took place in Douglas circa 1915 and are the physical expression of the prosperity and aspirations for modernity, as well as the Douglas building boom of the time. Architects from Denver designed the more important projects of this era, and the Douglas Hotel Company engaged the Baerresen Brothers to provide plans for the hotel. The hotel design emphasizes the size and massing of the building and approaches the physical presence of a civic building. The neo-Classical form and detailing is consistent with the design preferences of the era and the civic and commercial buildings erected in Douglas. 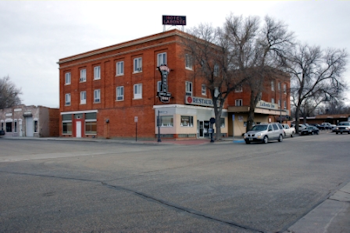 Despite the changes made to the ground floor level, the Hotel LaBonte still represents the increase in size and formality between the late nineteenth century and early twentieth century hotels erected in small Wyoming cities. 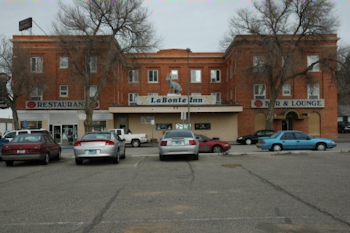 The Hotel LaBonte is eligible for listing in the National Register of Historic Places under Criterion A in the area of Community Development and Planning. The construction of the Hotel LaBonte in 1913 represents the maturation and modernization of Douglas as a commercial, transportation, and local governmental center in Converse County. The Hotel LaBonte, one of the largest of the new buildings erected in Douglas between 1913 and 1916, was the result of the resolve of a group of prominent Douglas citizens that the city would have a modern hotel. The Hotel LaBonte, financed by the wealth of the local cattle and sheep operations and related businesses, was a local project as much as a commercial venture. The hotel served businessmen associated with the local agricultural and energy operations and county residents, as well as travelers to the State Fair and was on one of the major routes to Yellowstone Park, contributing to the city’s tourism industry. The Huxtable Ranch Headquarters District is located in the southwestern corner of Converse County, Wyoming. The headquarters district lies along Boxelder Creek about 17 miles from the town of Glenrock in a slight depression between the first and second ridges of the Laramie Mountains. Elevation at headquarters is between 6200 and 6300 feet. The district encompasses 2.3 acres. The ranch, which is locally significant, consists of the 1933 residence and the outbuildings that were crucial to the ranch operation. They meet the registration requirements of the property types of Ranch houses and Auxiliary ranch buildings by serving the needs of the Huxtable family in their ranching operation. 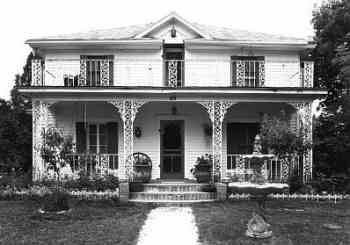 The house was constructed in 1933-1935 of local materials and housed members of the Huxtable family until 1986. The auxiliary buildings were constructed at various times, the earliest barn pre-dates 1929, and the latest being the two buildings that in 1952 replaced the shop and chicken house that were destroyed by fire. All the buildings were essential to the ranch during its historic period and have changed little over the years. Unlike so many agricultural operations today, there are no new metal buildings in the Huxtable Ranch Headquarters District. The District possesses a high degree of integrity of location, design, setting, workmanship, feeling, association, and materials. 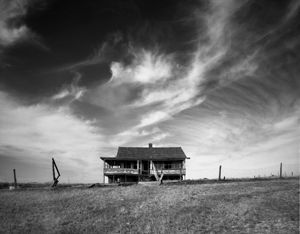 The Huxtable Ranch Historic District is eligible for listing in the National Register of Historic Places under Criterion A for its association with the theme of Subsistence and Self-Sufficient Agriculture. The Huxtable Ranch operated as a relatively self-sufficient unit, raising or growing much of their own food, from 1929 well into the 1950s. The Huxtable Ranch District is also associated with the theme of Modernization not by conforming to that pattern, but by serving as an exception to it, thus indicating the perseverance of earlier patterns of ranching in the face of pressure to modernize. Lloyd Huxtable resisted trends of modernization that involved the purchase of large expensive equipment on credit and mortgage of the ranch. He bought his first truck, a used telephone company vehicle for which he paid cash, in the early 1940s. In the 1950s, he purchased a used threshing machine only when the neighbor who had threshed for the entire Boxelder community since the 1920s retired. Huxtable was a thrifty, conservative rancher who believed that if you did not have the money, you did not buy it. He lived his life by his beliefs and the Huxtable Ranch in turn reflects those characteristics. The Huxtable Ranch was part of a larger ranching community known locally as Boxelder, named after the creek along which the first settlers homesteaded. Boxelder was just one community among a number of others in the mountains of western Converse County. These far flung ranching communities shared many characteristics: except for one or two big outfits, they were composed of small family ranches first homesteaded in the foothills and mountains of the Laramie Range in the 1880s. Although only minor physical changes have taken place on the Huxtable Ranch – new corrals, some modification of buildings - enormous changes have taken place in the Boxelder community that was once so vibrant. At one time there were approximately 25 children among the local families – the Huxtables, the Philbricks, the Bartshes, the Hisers, the Grants, the Hales, and the Gonsalves. These families pitched in and helped their neighbors when it was needed, at branding, ice cutting, at threshing and haying times. Their children went to school together for many year and the entire community attended dances in the log schoolhouse. Today, even though there are fourteen families living on the small ranches that have existed for decades, it is a far different community than the tight-knit, self-sufficient, year-round ranching one it replaced along Box Elder Creek. During the 2011 school year, the Boxelder Rural School will have only one student. The days of the self-sufficient ranch, for the most part independent of the national markets, have been gone for a long time. The modernization of American agriculture began over 100 years ago and included such innovations as the threshing machine, which facilitated the production of more grain, thereby propelling the small, family operation into the commercial market. Another component of modernization that went hand in hand with the new machinery was debt. The high cost of such new machinery as threshing machines, tractors, and pickup trucks, often signified borrowed money. 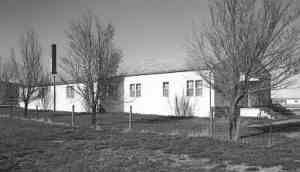 The fact that the Huxtable Ranch survived for so long as a debt-free, primarily self-sufficient operation is a testament to Lloyd and Najma Huxtable and the tenacity by which the older patterns of agricultural production prevailed in the relative isolation of the Boxelder community. The Huxtable Ranch reflects those earlier patterns. Constructed in 1916, the Jenne Block embodies both architectural and historical significance. The building was originally constructed and owned by pioneer Douglas citizen Jacob Jenne. Jenne was a successful and influential Converse County sheep rancher and businessman in the early part of the twentieth century. In 1915 Jenne purchased the lot at the southeast corner of Third and Center Street for $3,500, and in the following year he financed the construction of this ornate business block. The profuse use of terra cotta design elements reflects the prosperity of its owner and enhanced the building's appearance as an edifice worthy of the financial institutions and professional offices it contained. The Jenne Block is historically significant for the important role it has played as a locus of business in Douglas for over eighty years. The Jenne Block served as a bank and office building as well as the home of the Douglas Enterprise newspaper for several decades in the early twentieth century. Many of the businesses contained in the Jenne Block were important participants in the economic affairs of Douglas and rural Converse County. The La Prele Work Center is located in the La Prele Creek drainage on the southwestern slopes of the Laramie Range in southern Wyoming. It was originally built as a remote ranger station and converted into a work center when the La Prele Ranger District was discontinued in 1956. 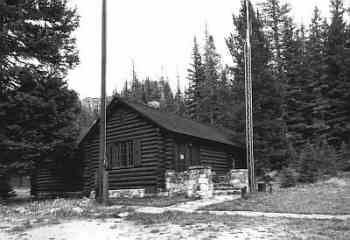 The USDA Forest Service facility has three contributory historic buildings built from 1937 to 1941. 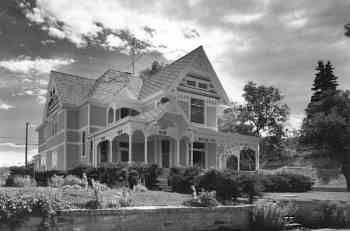 The Morton Mansion is a Late Victorian style, three story, wood frame house designed by prominent Wyoming architect William Dubois for pioneer sheep rancher John Morton. Built in 1903, the home was occupied for nearly five decades by the Morton family. The North Douglas Historic District is adjacent to the north and east sides of the original commercial district of the city of Douglas. Douglas was a railroad town created by the Chicago and North Western Railroad (Fremont, Elkhorn and Missouri Valley Railway), which built through the region in 1886, so that its original focus was the rail yards and depot. The North Douglas Historic District represents the expansion of early residential needs to the north and east of the commercial district. It is comprised of an area containing portions of fifteen blocks of the Original Town plat of 1886 and a small portion of the Phillips Addition platted in 1906. 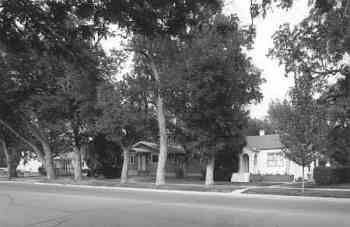 The district is characterized by both large homes and small simply detailed houses set regularly along streets. The majority of the buildings are one-story, wood fame residences that date from the early 1890s to the early 1940s. Most were built between ca. 1903 and 1912, generally reflecting Douglas’ decade of greatest growth. The District is important as a distinct and cohesive residential area integrally associated with and representative of the significant trends that contributed to the settlement and development of Douglas from 1886 through the 1950s. It contains a large concentration of the homes of “working class” citizens as well as the homes of a number of historically important and wealthier residents of early Douglas who played key roles in its economic, political and social growth. The pattern of homebuilding reflects the growth and development of Douglas from one of hundreds of railroad towns to a modern city and county seat with a diversified economy that today serves a regional ranching, energy, and industrial community. The Officer's Club, located on the site of the former Douglas POW Camp, was constructed in 1943. The Camp, consisting of 180 buildings, was among the 155 base camps and 511 branch camps that were constructed throughout the United States during World War II to house enemy captives from Europe and Japan. 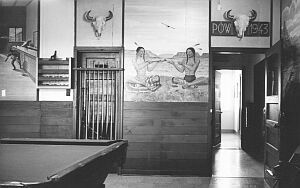 The Officer's Club, one of only a few camp buildings still standing, features sixteen murals painted by three Italian prisoners-of-war during 1943-1944. The murals are painted directly on the walls and depict icons of the mythical American west: cowboys, Indians, wagon trains, cattle drives, a stockade fort, and even the famous Old Faithful geyser in Wyoming's Yellowstone National Park. The Douglas POW Camp officially closed in 1946 and became the property of the War Assets Administration. A few local people, including members of the Douglas Lodge #15, Independent Order of Odd Fellows, fought to preserve the history of the Camp. 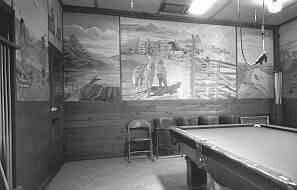 The Odd Fellows purchased the Officer's Club in 1963, has maintained the building, and taken pains to protect the unique murals.